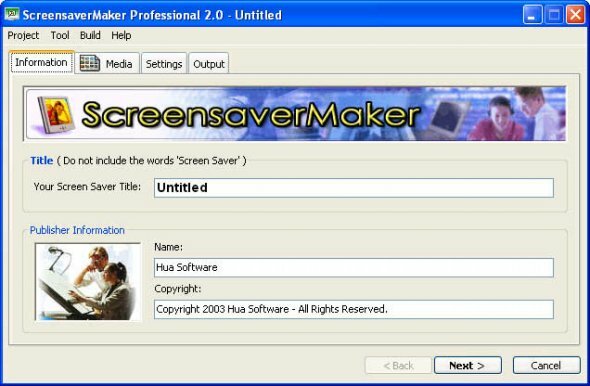 ScreensaverMaker 2.4.1200 - It has a fully integrated workspace that permits you to work efficiently and make professional screen savers in minutes. Slideshow Screensaver Maker 1.0 - Slideshow Screensaver Maker creates professional-looking screensavers using your photos which you can send to your friends and relatives. 3DScreen Builder 1.41 - 3DScreen Builder is a unique screensaver creation program. Though it creates a screensaver of your photos like other programs, it has one obvious advantage. Ace Screensaver 2.41 - Ace Screensaver is a small and easy to use screensaver maker program. It supports creating your own picture slideshow screensavers. Animated Screen 6.7 - Animated Screen converts your screen savers to self-running EXE files. The program compresses installation package so it can be easily sent over the Internet. Any Flash Screensaver Maker 1.80 - Any Flash Screensaver Maker allows you to make your own screensavers from your favorite Macromedia Flash movies within minutes. Flash2X Screensaver Builder 2.0.2 - Flash2X Screensaver Builder is a program to create Flash screensavers. Build Macromedia Shockwave Flash screensavers and distribute them to world wide. Flash ScreenSaver Master 3.2 - It enables you to convert Flash files (*.swf) to screensavers, or build slide show screensavers with your favorite images and adds MP3, WAV or MIDI as background sound. Internet ScreenSaver Builder 5.15 - Make screen savers updateable via Internet. Use images, text and avi/wav/mp3 files with wizard, transition effects and command language. Power Screensaver Builder Pro 3.0 - Create your professional image slide show screensaver, Shockwave flash screensaver and video movie screensavers quickly and without any programming. Fly Album 2.3 - Create attractive digital photo albums (electronic photo albums) in CHM format. With it you can make a lovely digital photo album with background music for your lover, kids and friends. Screen Saver Builder 3.32 - Make your own custom, slide show style, screensavers; select images and it will merge them into a Windows standard, (.scr) or self installable (.exe) screen saver file! Top Screen Saver Builder 1.0 - With this tool you can build windows standard SCR files or distributable self-installing executable file. There are many types of transition effects for you to choose from. Aone Photo Screensaver Maker 6.0.2 - Is a tool to help you make your own slide-show screensavers with photos, music and text captures. You can add any pictures (.jpg,.gif,.bmp,.png,.tif,.tga or .pcx ) and import audio files(.mp3,.midi or .wav) as background music to your creation. 2D+3D Screensaver Maker 3.61 - Allow you to create and distribute stunning 2D and 3D screensavers(slideshow screensavers, 3D screensavers, Flash-based screensavers and Movie screensavers + add your favorite music into projects) with no programming. African Animals Screensaver 1.7 - Shows images of wildlife from Africa. Also You will listen sounds from jungle. You'll see of animals. This screen saver contains 44 amazing images and 3 african tunes. Horses World Screensaver 1.0 - Shows images of graceful horses. On your screen: amazing arabic horses, horses in calm conditions, the animals in fast jogging and galloping, the horse and foal, horse romantic, sensitive views of loving horses couples and other nice views. Air Balls Screensaver 1.0 - Shows colorful images of air balls and balloons. The air constructions for flight have a whimsical forms. You see - a gavel, cow, Santa, atheletic shoe and other fantastic forms of balloons. Amazing air show. 365 Beautiful California Screen Saver - 2.1 - Reveals over forty BREATHTAKING VIEWS OF CALIFORNIA, including places like San Francisco, Yosemite, Los Angeles, Death Valley, San Diego and more. Tokio Hotel Screensaver 1.0 - Tokio Hotel Free Screensaver. Photos slideshow. Tokio Hotel screensaver. This free screensaver contains many pictures of Tokio Hotel. Amy winehouse Screen saver 1.0 - This free screensaver contains many pictures of Amy winehouse. Amy Jade Winehouse (born 14 September 1983) is a British soul, jazz, and rhythm and blues singer and songwriter. Active Media Eclipse 4.1 - Active Media Eclipse is the easiest to use Screen Saver Authoring Toolkit, which gives you the power to create stunning Screen Savers using your own images, pictures and sounds. Active Media Storm Developer Edition - Create those true multimedia effects with multiple Transitions on screen at the same time.